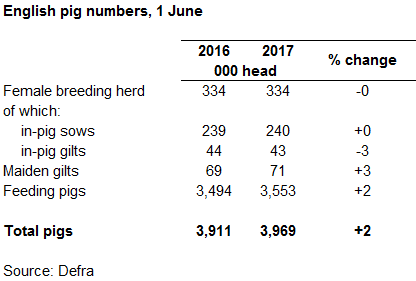 England's breeding herd remained stable in the year to June 1, although a small increase in the fattening herd took overall numbers close to the 4 million mark. Figures from the June Agricultural survey showed the he number of breeding pigs remained almost unchanged in 2017 at 416,000 animals. There was, however, a 1.7% increase in the number of fattening pigs, to 3.6 million. This drove a modest 1.5% overall increase in the pig herd to just under 4 million. AHDB suggested the latest census results might, again, 'remain a little inflated'. The reported growth follows from 'a somewhat surprising' annual increase in the pig herd reported in June 2016, in which both the finishing herd and breeding herd rose by 2%. However, slaughterings in subsequent months were almost consistently lower year-on-year, suggesting the absolute figure was somewhat overstated, AHDB said. Nonetheless, with a 2% rise in the breeding herd recorded in December last year, a 2% increase in fattening pig numbers seems plausible. Latest figures from Agrosoft, more details of which can be seen here, show an increase in sow productivity to 25.36 pigs weaned per sow per year, albeit still well below the EU average of 26.81. This would support the rise in fattening pigs and also explain the 5% rise in young pigs under 20kg, AHDB said. In contrast, the numbers of heavier pigs were virtually stable year-on-year. In terms of projected slaughterings, the figures suggest these would be expected to be comparable to 2016 in the short term, before picking up at the end of the year. Throughputs did move in line with year earlier levels in August, having been trailing behind last year in previous months. Within the female breeding herd, sows in-pig and other sows remained stable on the year, although there was a 3% decline in the number of gilts in-pig. The overall stability in the female breeding herd contrasts with the year-on-year growth shown in the December 2016 survey - given the increased profitability of pig production this year the change could be somewhat understated, AHDB suggests. "However, some anecdotal reports suggest producers have been investing in improving infrastructure, rather than further expansion this year. Nonetheless, the number of maiden gilts yet to join the breeding herd in June was up 3%, suggesting there could be further recovery on the horizon. Altogether, this would suggest that supplies might start to move up in the longer term, especially if sow productivity continues to improve," it said.